Kalamazoo, MI October 24, 2016 – The Kalamazoo Symphony Orchestra is proud to present the first concert in its 2016-17 Special Event Series, Ray Charles, Motown & Beyond! featuring Ray Charles’ protégé, Ellis Hall. Mr. Hall, a former member of the Tower of Power, produced this orchestra show to honor legendary musician, Ray Charles, after his death in 2004. The show celebrates their shared R&B roots and deep passion for the heart and soul of music. The program will be announced from stage and includes his own original works for the enjoyment of his audience. Ellis Hall, accomplished and prolific performer, multi-instrumentalist and vocalist with a five-octave range, is entertainment’s best-kept secret. In a career spanning over four decades, Hall has solidified a reputation for soul- searing Rhythm & Blues, and has electrified audiences throughout the world. Hall has also made a mark as an incredible songwriter, arranger, and producer. Born in Savannah, Georgia, Ellis spent the first five years of his life in the small town of Claxton, Georgia. Diagnosed with glaucoma as an infant, Hall lost sight in his right eye early on. Doctors informed his parents that Ellis would eventually lose sight his left eye as well. In an effort to afford Ellis the best possible education and care, his parents made the decision to move the family to Boston so Ellis could attend the Perkins School for the Blind. While at Perkins, he mastered the bass, guitar, keyboards, piano, and drums. As his sight continued to deteriorate, Hall readied himself for the inevitable by practicing his instruments in the dark. He refused to allow the disease to define him. Following many notable achievements in the world of professional performance, Hall moved to Los Angeles, California in 1984 to broaden his musical horizons and quickly became a First Call session player lending his vocal and instrumental prowess for many projects. In 1986, Ellis was the vocalist on the song “What Does It Take to Win Your Love,” a track on Kenny G’s 5-time platinum debut album Duo Tones. 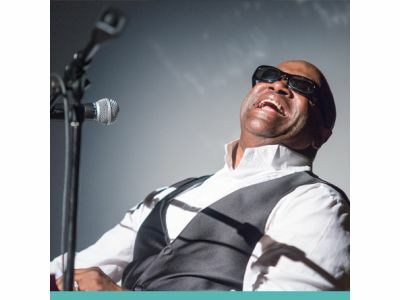 He has also performed with a multitude of musical icons, including Stevie Wonder, George Benson, Herbie Hancock, Earth Wind & Fire, George Duke, Michael McDonald, Brett Michaels, Billy Preston, James Taylor, John Mayer and his musical Mentor, Ray Charles. In 2001, Ellis met the legendary musical icon Ray Charles, who was so taken with Hall’s performance power that he took the artist under his wing. The following year, Charles signed Hall as the only other artist on his label Crossover Records. Following this major honor, Hall went on to work with Charles on the astounding album “Straight Ahead,” featuring an array of guest artists and garnering a top single “Gotta Get the Money” which landed at #5 on the Billboard Hot 100. Journalist Catherine Mabe said of Charles, “he appointed an heir apparent to his R&B throne.” Charles’s own manager, Joe Adams, made that out-right statement at the John F. Kennedy Center for the Performing Arts while introducing Hall as a stand-in performer for Charles, and declared that Hall was Charles’s protégé. Hall’s time with Charles, whom he fondly called Papa Ray, left an indelible impression. Following the icon’s death in 2004, he created a show in honor of The Master called A Tribute to Ray Charles, Motown, and Beyond. He envisioned it as homage to his mentor that would celebrate their shared R&B roots and deep passion for the heart and soul of music. Hall has realized this vision by performing key Motown and Ray Charles hits (Ellis-ized with his own soulful style) with symphony orchestras across the US and Canada. He considers the show not an imitation or emulation, but a soul celebration, and includes his own original works for the enjoyment of his audience. Since 2006, Hall has entertained thousands of music lovers performing with various symphonies, including the Nashville, Tucson, Honolulu, Long Beach, Houston, Memphis, Cincinnati, San Diego, Vancouver, Ottawa, and Edmonton Orchestras. Since 2010, Hall has also been invited back to his hometown on multiple occasions to perform with the Boston Pops Orchestra. In 2013, he headlined at the 40th July 4th Boston Pops Fireworks Spectacular. Ellis has worked with some of the world’s most well-known conductors, including Marvin Hamlisch, Bob Bernhardt, William Eddins, Keith Lockhart, Jeff Tyzik, and Steve Reineke of the New York Philharmonic. Following a performance in 2010, it was Tyzik who first referred to Hall as the “Ambassador of Soul”, after Ellis had jokingly commented, “I spent a lot of time working on my ambassadorship.” The moniker stuck. Hall’s passion for music has also led him to share his powerful vocals over the years on a variety of other projects. He was a lead voice in the animated blues/soul band The California Raisins, and the whimsical Beetlejuice for a Universal Studios show. A versatile talent, Hall is a star of numerous film soundtracks, including The Lion King 2, Chicken Run, Shrek 2, A Bug’s Life, Bruce Almighty, Beneath the Darkness, and Invincible. He has even had acting roles in the box office hits Big Momma’s House and Catch Me If You Can. He also served as advisor to Jamie Foxx on the set of the movie Ray. He lives in Los Angeles with his wife and manager, or “wife-ager” as he fondly calls her, Leighala Jimenez-Hall.